The new logo of the Nouveau centre néerlandais in Paris! We are very glad to have worked with the Nouveau centre néerlandais on their branding. Creating their visual identity as well as their website and printed communication media. The Nouveau centre néerlandais offers dutch language and culture courses and is the largest dutch language school in France. More on our project page. The new website of the Atelier Néerlandais launched just recently! We are very glad to have worked with the Atelier Néerlandais to create their new website. The Atelier Néerlandais is a platform for the Dutch creative industry in France and is part of the Embassy of the Netherlands. The Atelier helps to promote dutch design, art and literature from their office in Paris. Organizing lectures, special events, exhibitions and facilitating with their office-space. The new website combines a functional and user-friendly interaction design with the minimalist cool aesthetic of the Atelier Néerlandais. During the project we helped with the editorial design and information structure and the overal design and realization of the site. 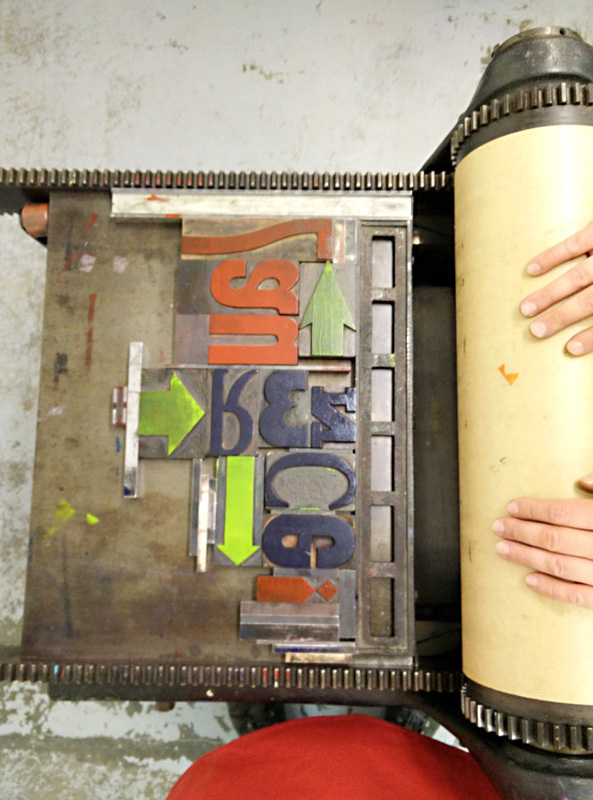 Integrating the existing typographic identity, using it in a more functional manner. And creating a totally new structure, focussing on use-ability and clear information design. Highlighting the news and the members of the Atelier. For the technical implementation and development we were glad to have been collaborating with digital design studio Drost&Co. 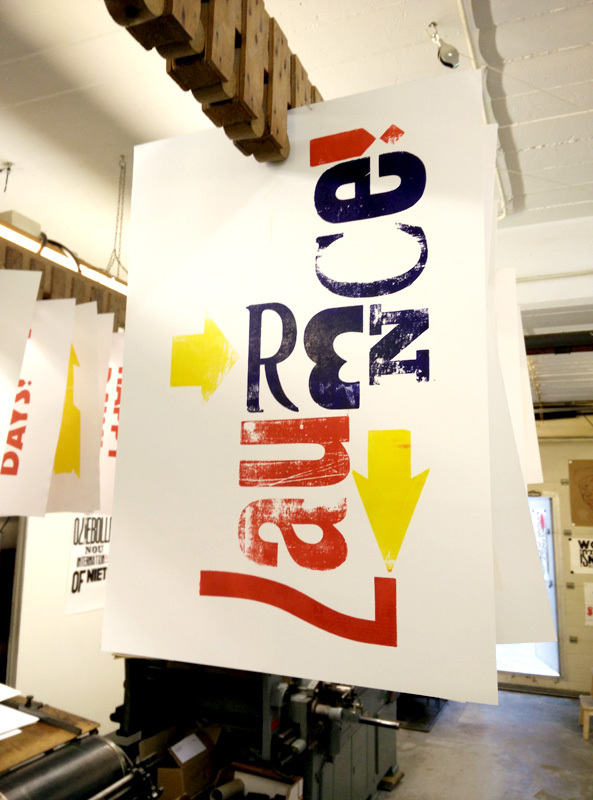 Recently I managed a poster workshop at the ECV Design school in Lille. 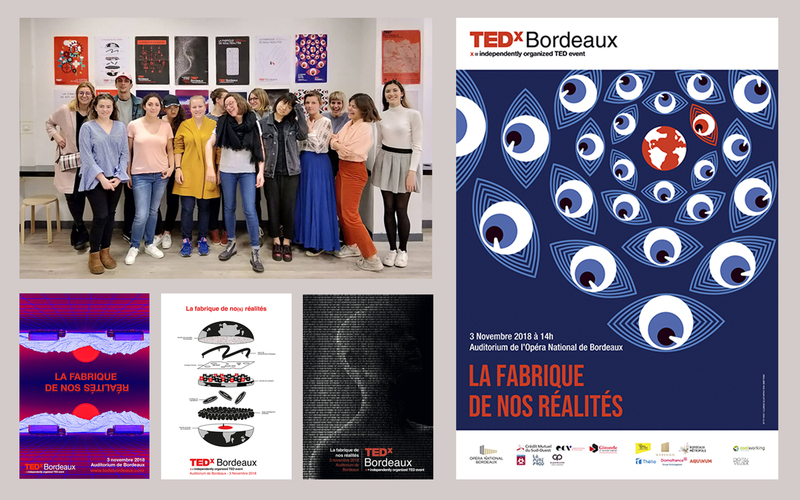 The students had to design a poster for TEDx Bordeaux. With the cryptic title ‘La Fabrique de nos Réalités’ (The factory of our realities) concerning the human influence on the planet. The students worked very hard on different ideas and concepts before creating their final designs. Of the 15 design submissions finally one was chosen by the TEDx Bordeaux volunteers. The poster-concept consisting of eyes surrounding the earth. The design will be used for the final poster and will be the basis of the visual identity for TEDx Bordeaux 2018. Check out the article (in french) on the website of ECV. Proud of the students and of the creative results and great to have been part of the project! We reprised our workshop visual storytelling and editorial design. Reinterpreting the city. Telling the story of Lille. The 2018 exam students of the ECV school in Lille worked very hard for one week on researching the different neighborhoods of this diverse city in the north of France. Each group did visual research in their neighborhood, creating images, gathering material and interviewing the population. And interpreting what they found. Finally each told the story of their chosen neighborhood, through their unique eyes as designers. And finally created a series of magazines and posters. Great results for one week work! 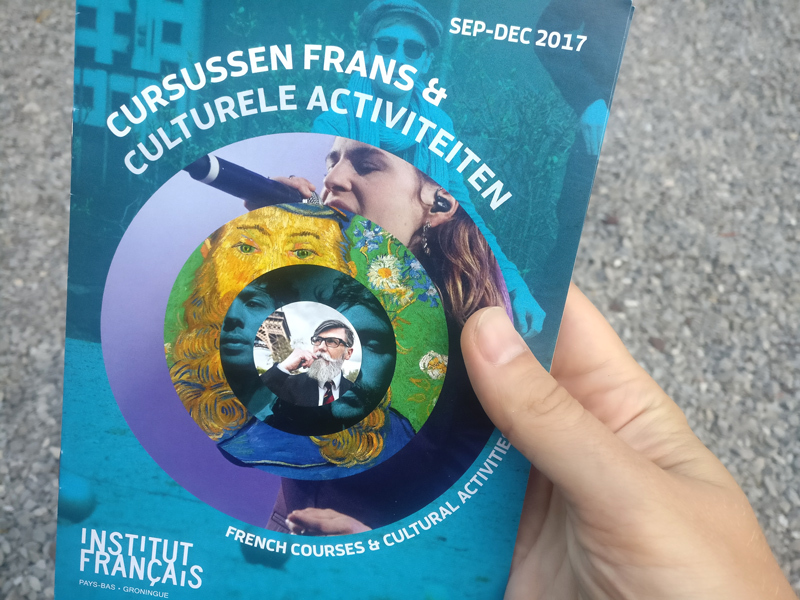 The latest new program brochure for the Institut Français in the Netherlands (season January-August) is out! This new brochure has a similar ‘tourne-disque’ front cover image like the other one in this series. But now uses a red color scheme. The disc shape contains several layers of images, forming a mix of French culture. After being responsible for the previous season’s brochures (2016-2017) we’re very happy to have worked together again with the Institut and being able to create the two brochures for the current season! Just out! The new program brochure for the Institut Français in the Netherlands, for september-december. 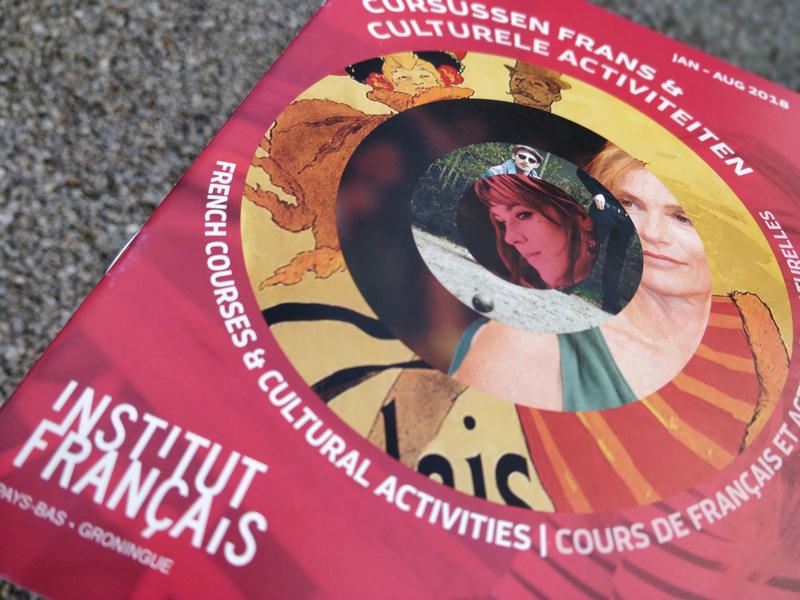 The Institut Français organizes french language courses and cultural activities and is supported by the French ministry of foreign affairs. The ‘tourne-disque’ front cover image shows a disc with several layers of images, forming a mix of French culture. After being responsible for the previous brochures (2016-2017) we’re very happy to work together again with the Institut and create their brochures for this new season! 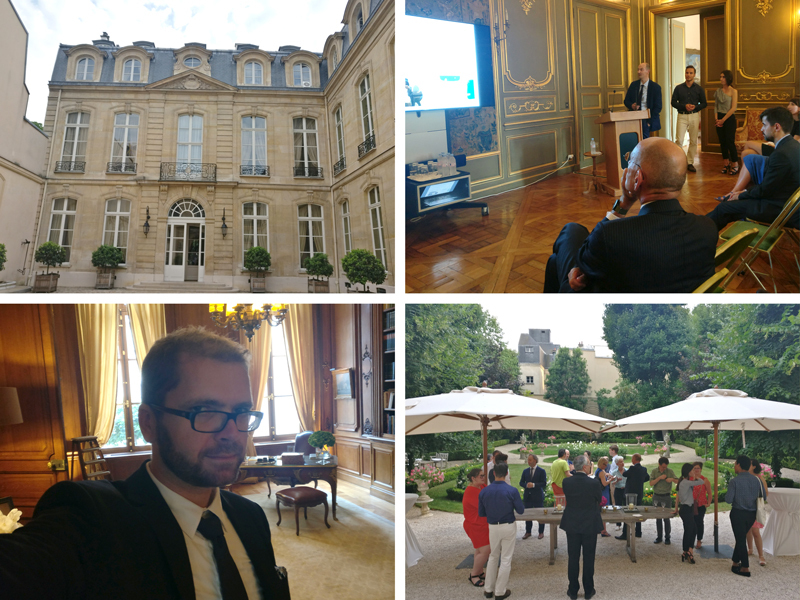 At the end of june I attended the award ceremony for the ‘Prix d’Amsterdam’ of 2017, at the impressive Hôtel d’Avaray, residency of the dutch ambassador in Paris. Where a talented french researcher was awarded the prize of €15.000,-, supporting her research on french and dutch prints from the golden age in Amsterdam and Paris. At the same event two of our recent activities were presented. Both of them supporting french-dutch relationships. We are honored and glad to have contributed in this way. The Réseau franco-néerlandais, which also manages the Prix d’Amsterdam, gave a presentation of their activities from last year, promoting exchange between the Netherlands and France in the field of higher education. An important feature was their new website. Mentioned was the success and impact of the site, with an ever increasing number of visitors and larger engagement. With KAUSA we helped with the online strategy, creation and development. During the second presentation I participated in a team presentation, showing the award-winning idea, called ‘Le Kijkdoos’, which we created during the ‘Hackathon #404’ event in may. During this 3-day event, organized by the MEL and the RFN, students and young professionals developed new ideas to improve relationships between the city of Lille, in the north of France, and cities in the south of the Netherlands. With the award we will now try to realize our project, an interactive installation, for the next year. Together with António Ferreira, a personal development coach and urban planning researcher, we organized a workshop called ‘Refining Professional and Personal Dynamics’ which took place in july at HOF20, center for personal development in Haarlem. We combined our knowledge from the academic, personal development and communication fields to create this full-day workshop. In a playful and insightful way we helped people refine their professional and personal dynamics. 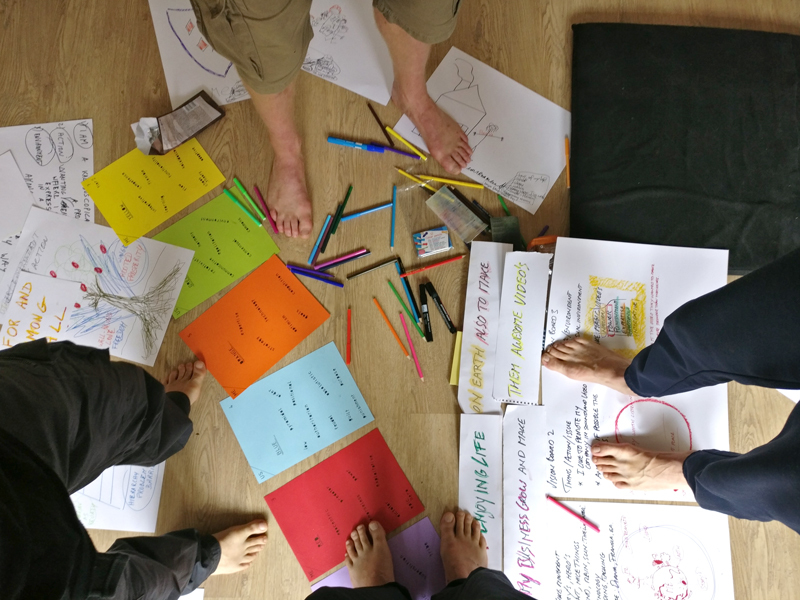 During the day we combined dynamic body work, reflection, expressive group exercises and creative visualizations. At the end the participants used their new insights to create boards to define their personal and professional vision. It was great to organize this workshop together, the participants were enthusiastic and created inspiring results! During the ‘Hackathon #404 Territory Not Found’ students and young professionals were working on ideas to strengthen ties between Lille, the main city in the north of France, and southern dutch cities. My team and I won the final pitch with our idea. Our concept is called ‘Le Kijkdoos’, roughly translated in ‘viewing box’. It is based on an ancient dutch custom where children use an old shoe-box to create a diorama with small figures, telling a story. The top of the box has transparent paper which lets through light. The front has a small peeping hole to look inside and see the show. The element of wonder and anticipation of ‘what’s inside the box? !’ is the starting point of our idea. Which will be a catalyst to get people exited about the different cities and strengthen their ties. We want to transform the ‘Kijkdoos’ into a large interactive installation. To be placed on the main squares of the participating cities. People would walk past it and be intrigued, they would have to possibility to look and see what’s inside this box. Inside we would show an unexpected perspective on the city, making people interested to learn more and connect with the city. 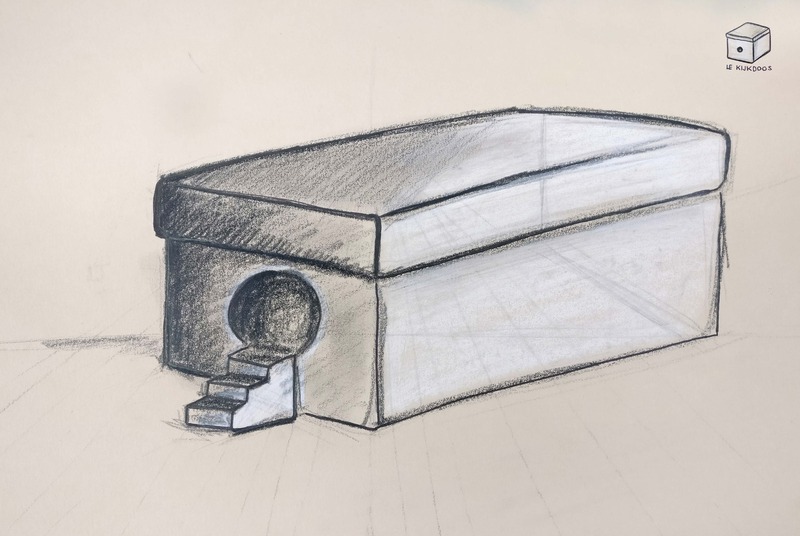 An important part of our idea is that our Kijkdoos is not just a ‘Kijkdoos’, but a vehicle to connect people, cities and cultures in various ways. The visitors, but also the content creators. We would like to invite inhabitants from different socio-economical groups to participate. To show parts of the city that are special to them. Although our project is suitable for all the cities in the south of the Netherlands and for Lille. First the focus lies on 2 cities, namely Rotterdam and Lille. Celebrating the 60 years anniversary of their sister-city bond in 2018. At the moment the project is in further development. 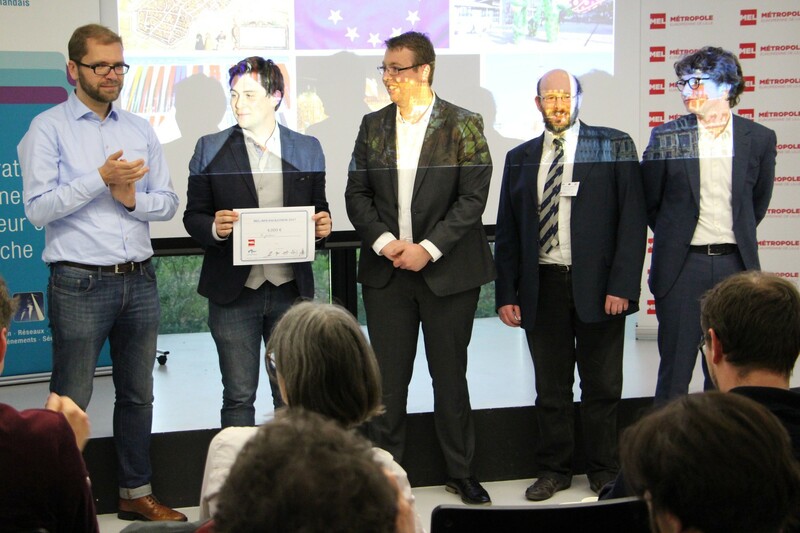 Recently I was invited to participate to the ‘Hackathon #404 Territory Not Found’, a 3-day event organized by the Métropole Européenne de Lille and the Réseau franco-néerlandais. Students and young professionals from France and The Netherlands brainstormed together to develop new ways to strengthen ties between the Lille Metropolis in the north of France and southern dutch cities. And gathered together with representatives of the dutch and french economic and cultural sector to talk about these subjects. 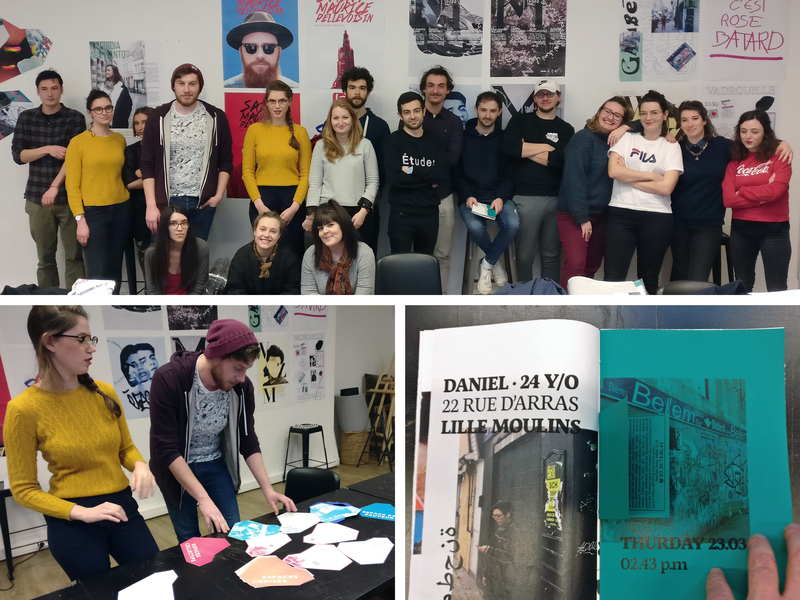 Recently I gave a 4-day workshop, titled ‘Reinterpreting the city – Telling the story of Lille’, for the Master 2 graphic design students of the ECV Creative Schools & Community in Lille, North of France. Goal of the workshop was for the students to use their creative skills and show the city of Lille from a new perspective. 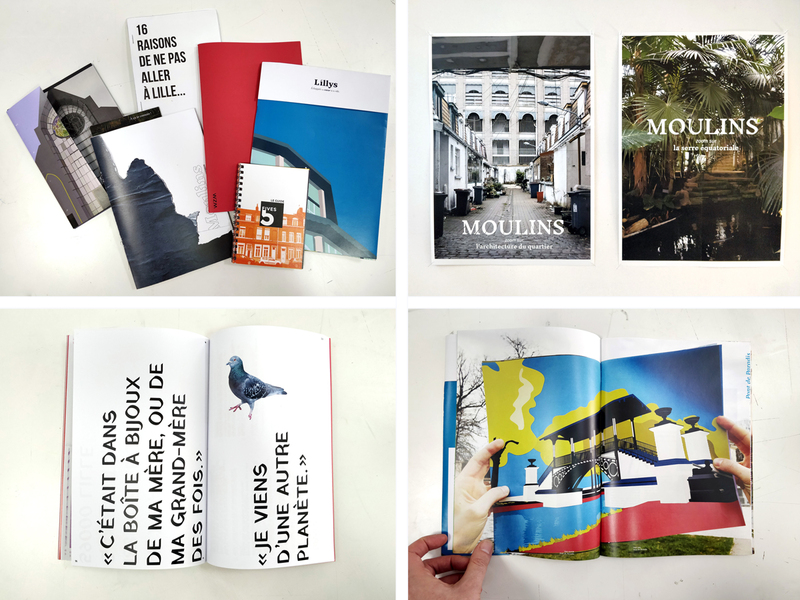 Telling the visual story of Lille through the creation of a series of magazines and posters. The students worked in teams, each focussing on a specific neighborhood. Doing visual field-research, interviews, gathering information and giving their unique interpretations. During their final presentation the students presented their projects, showcasing the different neighborhoods in a series of graphic posters and magazines. Highlighting the diversity of the city and showing Lille from new perspectives. The final works were exhibited during the open days of the school. 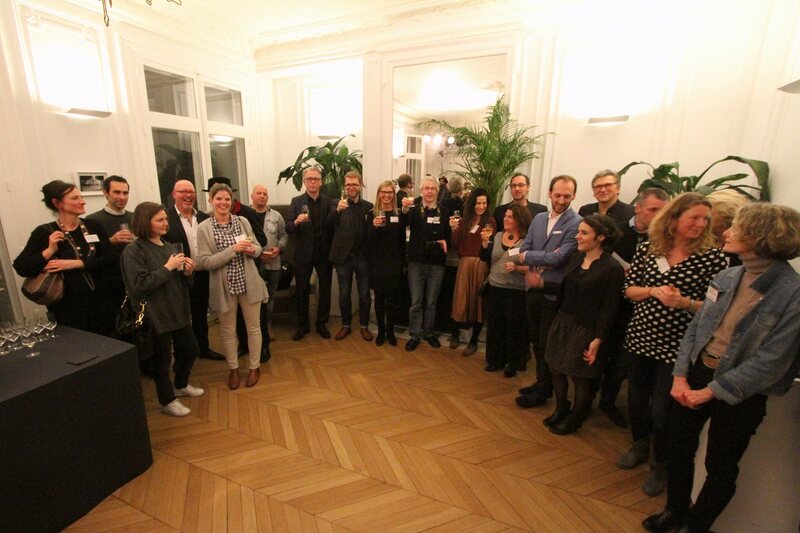 Nice to attend the new years reception of the Atelier Néerlandais in their beautiful office in the Hôtel Turgot in Paris. I became a member recently of the Atelier. It’s an organization set up by the Dutch Embassy to promote dutch culture and design and to facilitate dutch creative companies and organizations to do business in France. Testing the cover and the embossing. 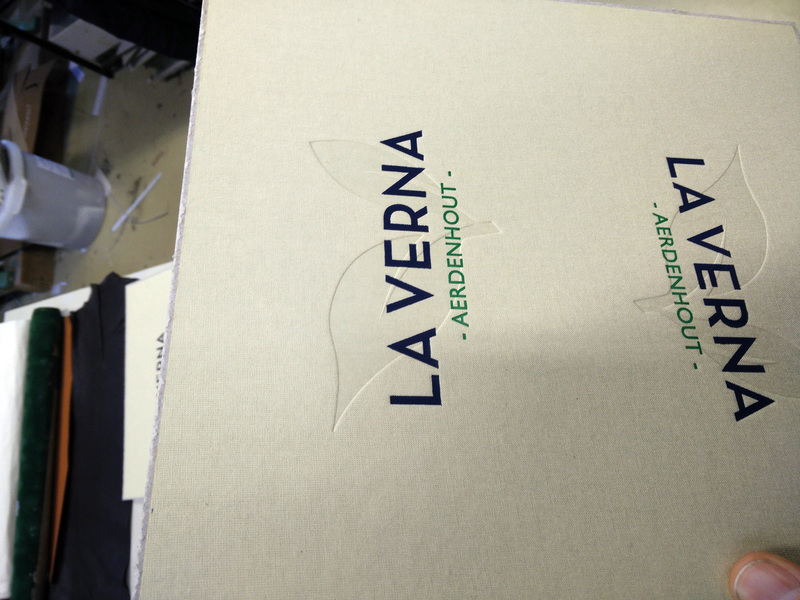 The cover is part of a promotional book about La Verna, a real estate development in Aerdenhout, close to Haarlem. Great work by printer De Bink in Leiden and bookbinder Van Waarden in Zaanstad. KAUSA was responsible for the branding of the real estate project, in which the book played a large part. Next to the design we were responsible for the project-management, editorial design and development of the book. 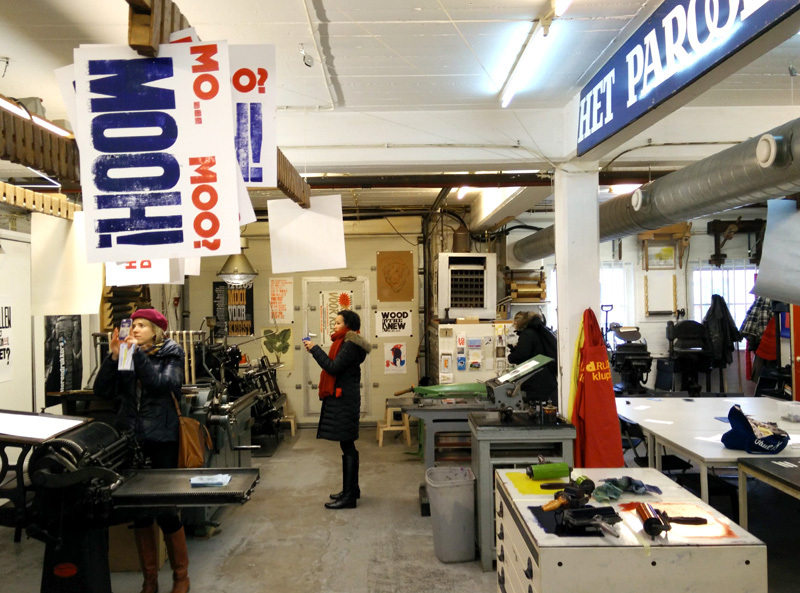 Recently I attended a 2 hour mini-workshop called Step away from the computer at the Grafisch Werkcentrum in Amsterdam Oost. 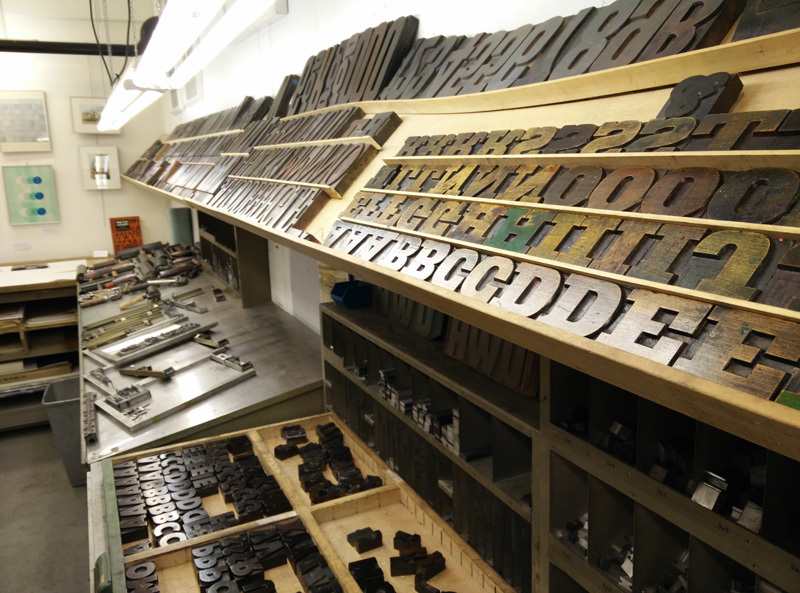 Getting away from the computer and literally back in touch with the basics of printing. Trying out intaglio and relief printing techniques with their machines, with help of the volunteers. 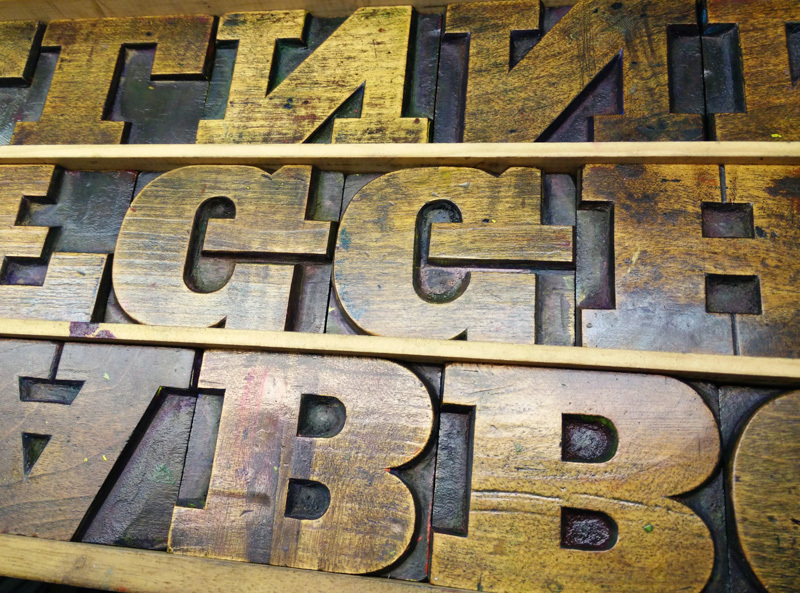 Nice to be busy with (wood and lead) letters you can touch. Storytelling is a word used a lot today in the mediaworld and other professions now. But what is a storyteller really? Here’s the point of view from Stefan Sagmeister. Living in the now can be tiring in these digital times. Interesting short film where media theorist Douglas Rushkoff discusses the Always-On Digital Culture. And the anxiety and influence it creates in our daily lives. Also the subject of his 2013 book, Present Shock: When Everything Happens Now. 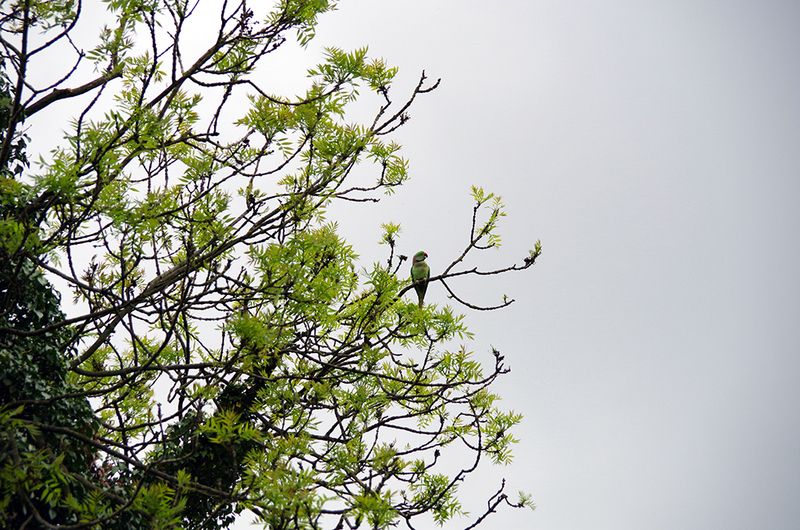 Halsbandparkiet / Rose-ringed parakeet in the Vondelpark Amsterdam. Originally from Africa and India there are now around 10.000 of these birds in the Netherlands.